Fruity marshmallow gummies in the shape of cats and mice and in the delicious flavors of strawberry, raspberry and lemon. Approximately 530 individual product pieces are included in this round, resealable plastic container. 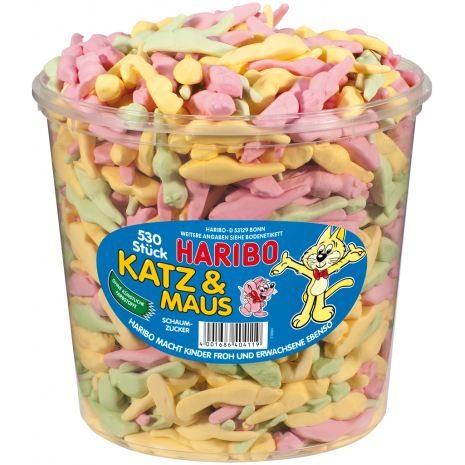 Deliciously fruity marshmallow gummies in the shape of cats and mice. Those colorful little gums come in the flavors strawberry, raspberry and lemon. Approximately 530 individual product pieces are included in this round, resealable plastic container. 1060g / 2.34 lbs NET. WT. Sugar, glucose syrup, dextrose, gelatin, fruit and plant concentrates: safflower, lemon, apple, spirulina, citric acid, flavoring, glazing agents: beeswax white and yellow, carnauba wax, colors: turmeric extract, cochineal extract, invert sugar syrup. Zucker, Glukosesirup, Dextrose, Gelatine, Frucht- und Pflanzenkonzentrate: Saflor, Zitrone, Apfel, Spirulina, Säuerungsmittel: Citronensäure, Aroma, Überzugsmittel: Bienenwachs weiß und gelb, Carnaubawachs, Farbstoffe: Kurkumin, echtes Karmin, Invertzuckersirup.